Click here to get the PDF version of the Garry Oak Leaflet, Spring 2015. Click here to get the PDF version of the Garry Oak Leaflet, Spring 2014. View historical GOMPS newsletters online -- Click here to display a list of them, The Leaflet, from 1994 - 2010, in PDF format. If you need to download Adobe Acrobat click here https://get.adobe.com/reader/ . 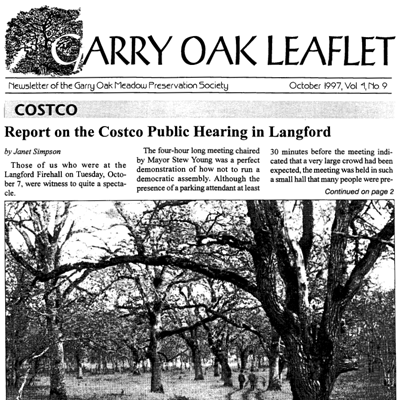 Also, a compact disk of past issues of the Garry Oak Leaflet, from Vol. 1 issue 1 September 1994, up to our current issue are available; either as a single searchable file or as individual searchable files. Also on these disks are the 1993 Garry Oak Colloquium Proceedings. Price is five dollars each which includes postage. Also, in the past, GOERT published copies of our newsletter. They are available from this page hosted by GOERT.